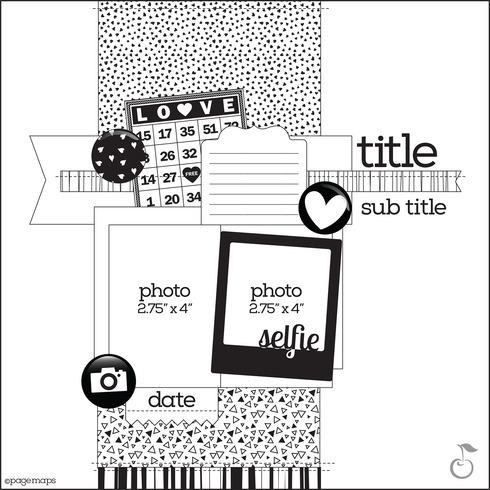 These next 2 layouts both use things I randomly selected for my January Use It or Lose It Challenge. I am using this month to use up whatever I didn’t use last month. Just to give things “one last chance”. First up is the Bo Bunny “Alora” pattern paper. 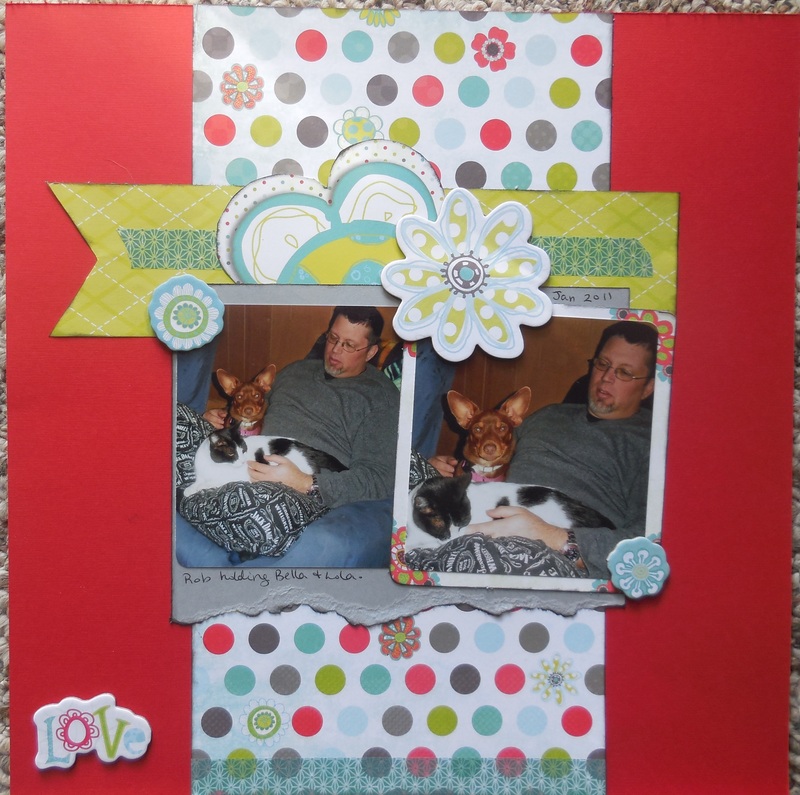 I cut the sheet in half, and used a few of the chipboard pieces to showcase these cute pics of my husband holding Bella and Lola back in 2011. With that said, all I have left from that collection is the other half of the pattern paper and some chipboard pieces. I went ahead and punched out the pieces and they are now considered my “go to embellishments” when a layout or card needs that “one more thing”. They were a bunch of starts, hearts and flowers. Perfect! The second layout is using up the Basic Grey “Fact or Fiction” sheet of paper. I kept looking at that sheet, but it just wasn’t doing much for me. LOL. So I flipped it over and saw that it was a very distressed yellow. Not my color, but when paired with the following pics of me posing with some PEEPS candy back in 2011, it was a perfect match! 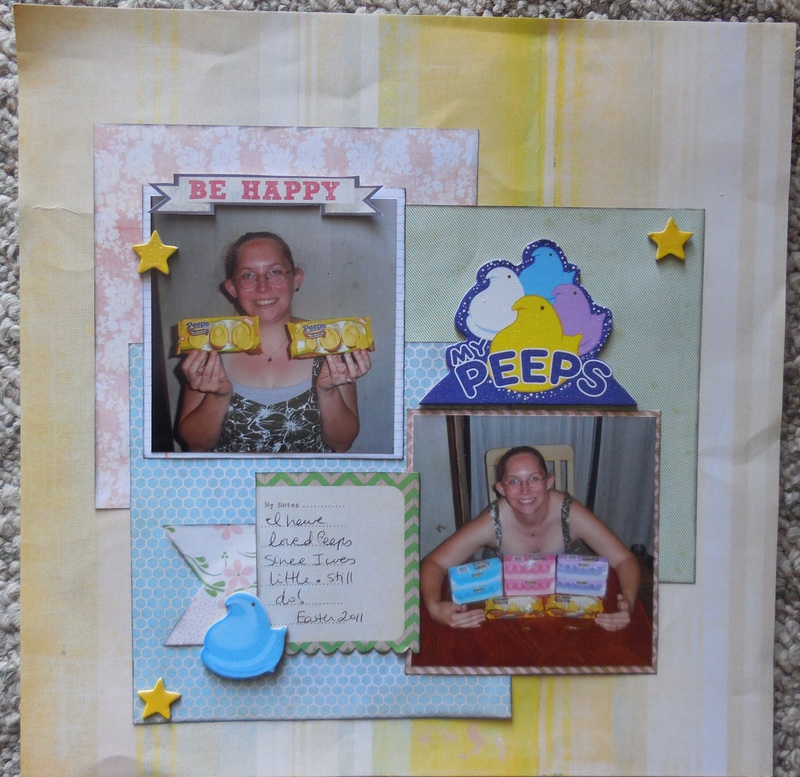 I used other sheets from that collection (the 6X6 paper pad), along with chipboard stickers from a VERY OLD Creative Imaginations “PEEPS” collection. I now have a bunch of scraps from the Basic Grey collection, quite a bit from 6X6 paper pad and a bunch of odds/ends from sticker sheets and embellishment packs. Time for me to sift thru and clean up that little bag too! All I have left now is the MME Lush 2 fuschia pattern paper and the hot pink Webster’s Pages ribbon. Off to see what I can find to scrap with those 2 items! 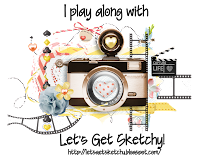 By blbabe1234  Posted in Scrap-A-Day	 Tagged Basic Grey, Becky Fleck Sketch, Bo Bunny, Use It or Lose it!